It sounds ridiculous when someone says that you can build a gaming PC without a discrete graphics card. 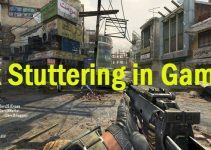 This is because graphics card is one of the most important components of a gaming PC and if you don’t have a good graphics card installed then you won’t be able to play and run latest games at decent graphics settings and resolution with respectable frame rates. However, it is now possible to build a decent budget gaming PC without graphics card because of some of the powerful integrated GPUs that come along with your processor. These powerful processors come with both CPU and GPU on a single die and they deliver very good performance in both processing and graphics department. Using these processors with powerful integrated GPU, you can build a budget gaming PC, eSports Gaming PC or console killer PC, and easily play most of the latest AAA games on low-medium graphics settings at 720p/ 900p or 1080p, depending upon how demanding the game is. So, here I am going to build a cheap gaming PC without the need of graphics card so that you can have a decent gaming experience without spending too much money. You can also upgrade this gaming PC with a discrete graphics card in the future when you have saved enough money to buy one. This budget gaming PC without graphics card is capable of running some of the popular and demanding games like Fortnite, GTA 5, Far Cry 5, PUBG, Battlefield 1, Call of Duty: Infinite Warfare, Rise of the tomb raider (ROTR), Assassins Creed Origins, Overwatch, Fallout 4 and many more. 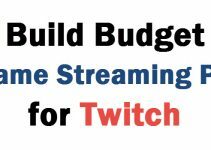 Here are the components that you need for building a budget gaming PC without a graphics card. This cheap gaming PC can also serve as a good HTPC, work PC and a multimedia PC for watching Blu-ray and FHD movies. 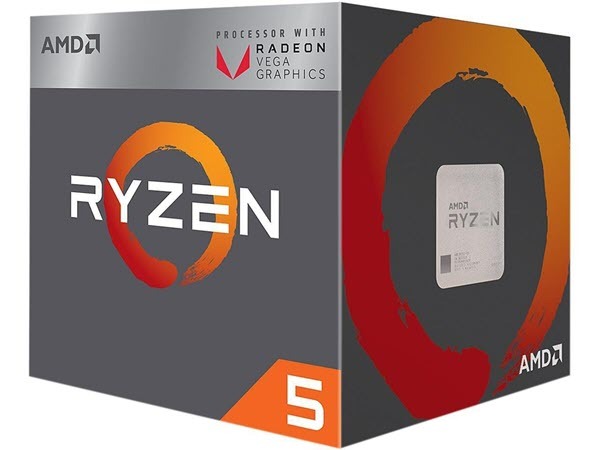 The processor that I have chosen for this budget gaming PC is AMD Ryzen 5 2400G. It is a powerful Ryzen 5 2nd generation Processor that comes integrated with Radeon RX Vega 11 Graphics. The processor is based on the AMD’s Zen architecture built on the 14nm manufacturing process. In AMD terms this is actually an APU or Accelerated Processing Unit , which stands for a processor that comes with both CPU and GPU on the same package or die. This new APU series with Zen architecture is code-named as Raven Ridge. It is a quad core processor with eight threads and has got base clock speed of 3.6 GHz, boost clock of 3.9 GHz and 6MB total cache. This processor requires AM4 socket motherboard and has TDP of 65W, which is think is pretty good for such as powerful processor. Talking about the graphics department, the processor comes with Radeon RX Vega 11 GPU which consists of 11 Graphics Cores and 704 Stream Processors. The GPU operates at clock speed of 1250MHz which is quite pretty good too. This is the most powerful integrated GPU and its performance is almost equal to that of GeForce GT 1030, which is a budget graphics card from Nvidia based on the Pascal GPU architecture. The GPU is capable of running latest games on low-medium graphics settings at 720p / 900p or 1080p resolution and you can easily play older games at medium-high settings at 1080p. To get the maximum performance out of integrated GPUs you will require a faster RAM with maximum supported clock speed. This GPU can run GTA V on high settings at 1080p resolution with 40 to 50 frame rates comfortably, and this shows the power of this Radeon RX Vega 11 GPU or the AMD Ryzen 5 2400G Processor as whole. Another good thing about this processor is that you don’t have to purchase a separate CPU cooler for it as it comes bundled with Wraith Stealth cooler which is sufficient for this AMD APU. Also, it is an unlocked processor and you can overclock both the CPU and GPU to higher frequencies using AMD Ryzen Master or BIOS to get the maximum performance out of it. You need a Socket AM4 motherboard for the above processor that supports Ryzen 2nd generation processors. 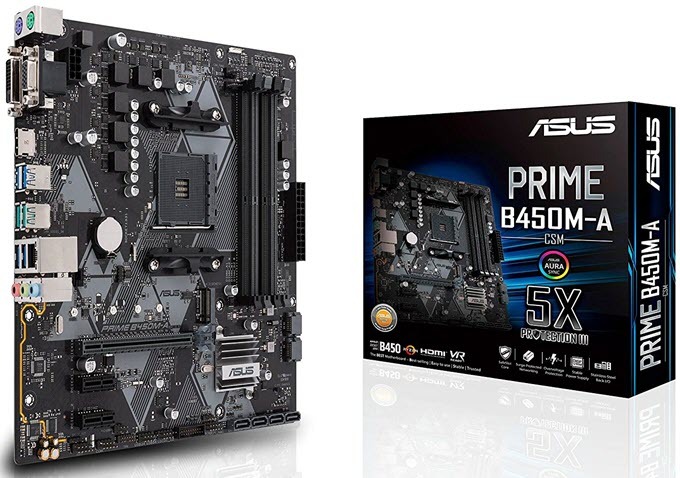 The motherboard I have selected here is ASUS PRIME B450M-A/CSM which has Micro-ATX form factor and is based on the mid-range AMD B450 chipset. This budget B450 motherboard supports all AM4 socket processors and 64GB DDR4 RAM up to 3200 MHz. It has got one PCI-E 3.0 x16 slot for graphics card, two PCI-E x1 slots for add-on cards and one M.2 slot that support SATA SSDs and super-fast NVMe SSDs @ PCIE 3.0 x 4 mode. This is very good motherboard for the price and has got all the standard features that you need for building a gaming PC or work PC. Other features include Asus SafeSlot, UEFI BIOS, 8 Channel Audio, Gigabit LAN, Asus Aura Sync RGB Header, USB 3.1 Gen 2 ports AMD StoreMI and Overclocking support. For display connectivity, it has got VGA, DVI and HDMI ports at the rear. For this budget gaming PC, 8GB of RAM should be sufficient for most of the games. Here I have picked 8GB Ballistix Sport LT DDR4 RAM which is a DDR4 Gaming RAM and has clock speed of 2666MHz. This is a low profile RAM which means it can fit in tight spaces and have no clearance issue whatsoever. The RAM sports Digital camo heat spreader which is available in white, gray and red colors. It is compatible with both Intel and AMD CPUs and works great without any issues. 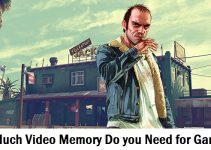 You can upgrade the RAM to 16GB in future for games that are more demanding but for now 8GB is sufficient if you don’t run anything in the background while gaming. A standard 1TB hard drive is enough for storing games and your data. 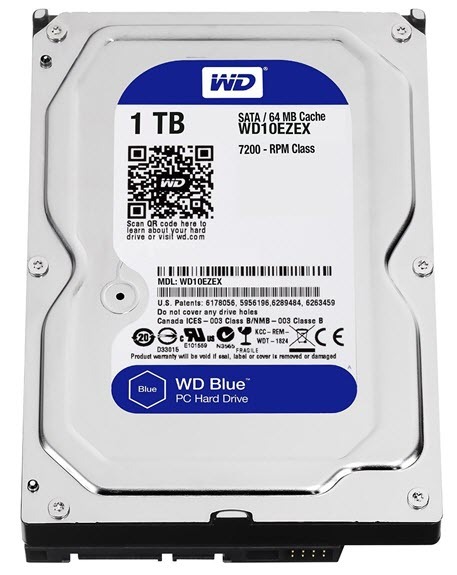 Here I have selected WD Blue 1TB hard drive which is a very reliable HDD and offers decent performance. It has got 64MB cache and has spindle speed of 7200 RPM. You can also opt for the Seagate Barracuda 1TB HDD but I prefer WD Blue more. If you want to speed up your operating system more and reduce its boot time then in future you can buy a 2.5-inch Solid State Drive having 250GB capacity. You can check some of the best solid state drives going to the link given below. There is no discrete graphics card installed in this affordable gaming PC but if in future you want to increase the graphics processing power for latest upcoming games then you can easily add a decent mid-range graphics card to this PC. Below are some of the best mid-range graphics cards for different budgets. To power this budget gaming build, a decent 400W PSU should suffice. Here my choice is EVGA 450 BT, 80+ BRONZE 450W PSU which is a budget 450W power supply having 80+ Bronze Certification that offers 85% efficiency or higher under typical loads. The power supply comes with single 12V Rail having 35A current on it. For graphics card, it has two 8pin (6+2) PCI-E power connectors and it can easily support a powerful mid-range graphics card. The power supply comes with 120mm fan which is pretty quiet even under full load. The main 24-pin motherboard cable and 12V CPU cables are braided while others are not. It has got all the heavy-duty protections including OVP (Over Voltage Protection), UVP (Under Voltage Protection), OCP (Over Current Protection), OPP (Over Power Protection), and SCP (Short Circuit Protection). 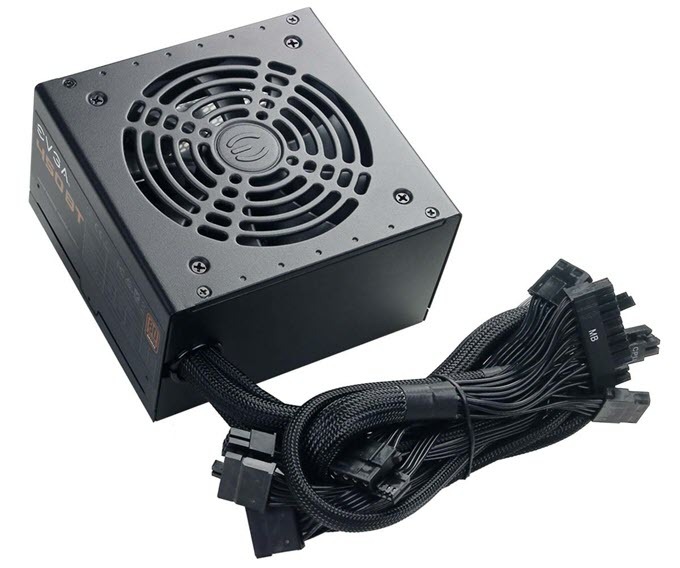 If you are unbale to find this PSU then another good option is Corsair VS450 which is also a 450 Watt power supply. The case I am using here is Corsair Carbide 100R Mid-Tower case. It is an elegant, sleek, clean and modern design budget computer case that can support up to ATX sized motherboards. The case can easily accommodate all the above mentioned components and it also has enough space for a mid-range to high-end graphics card if you plan on adding it in future. For cooling, the case supports up to five fan mount points and a 120mm rear fan comes included with it. The front panel is mesh free and you will find three USB 3.0 ports and audio ports on the top. The case can support high-end graphics cards up to 414mm in length on top slots and on lower slot it can fit graphics cards up to 275mm in length. The maximum height of the CPU cooler supported by this PC case is 150mm and it supports PSU up to 260mm in length. The transparent windowed panel lets you peek at all of your components and both the side panels comes with thumb screws for easy access or removal. One best thing about this case is that it includes two 5.25” inch bay for adding an optical drive or a 5.25-inch fan controller. For storage, it supports dual purpose 3.5”/2.5” drive bays for SSDs and Hard Drives. Other features include cable routing and tool-free drive installation. 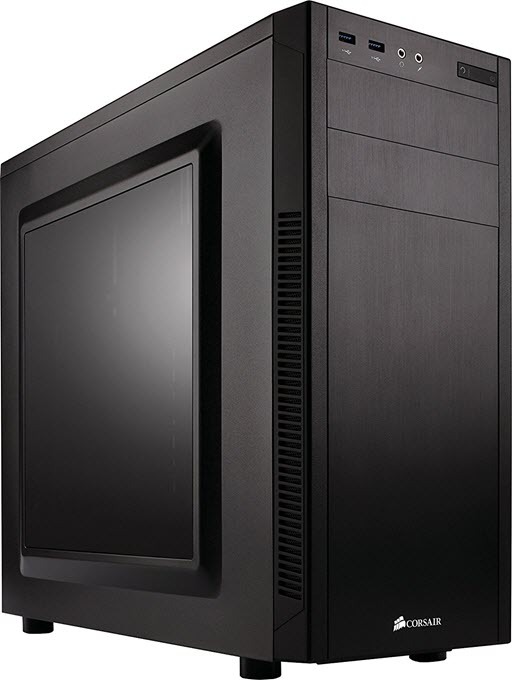 There is also silent version available for this case as Corsair Carbide 100R Silent for building a quiet PC. You can check out both these variants from the link given below. The above budget gaming PC will cost you well under 500 dollars and the best thing about this gaming PC is that it is equipped with a powerful processor and you can easily upgrade to higher graphics card in future when you have saved money for it. Also, you can upgrade to more RAM and SSD for extra performance and speed. However, till then this budegt gaming PC is more than enough to satisfy your casual gaming needs and work needs. If you have anything to ask about this PC or components then please leave a comment below.